the mother of two sons, grew up in New Jersey and moved to New York shortly after her college graduation. She has lived in both Harlem and Queens, but has resided on Long Island for over twenty years. She earned her bachelor’s degree in English from Dartmouth College and her master’s degree in Writing from New York University. 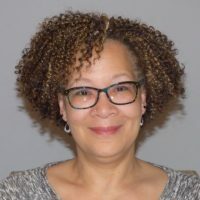 McNair was an assistant editor at Essence Magazine and is currently an Associate Professor of English, Journalism, and Women’s Studies at Nassau Community College. She is the former coordinator of the NCC African American Read-In and a current member of the Black History Month Committee and the Secretary for the Black Women’s Initiative (a student retention program). In addition, she was an adjunct professor of English at Molloy College, where she taught African American Literature, for over five years. She served on the Uniondale Community Council Executive Board for two years. She is the Executive Director and Founder of Long Island Girl Talk, a program for teen girls interested in media, and a co-host on Café Long Island, a public access television series. McNair’s essay, It Takes a Lioness to Raise Young Lions, appears in Issues in Feminism/ An Introduction to Women’s Studies/Fifth Edition (Mayfield, 2001). Her creative nonfiction story, Before We Were Gangstas, won honorable mention in the National New Millennium Writers Creative Nonfiction contest in 2003 and appears in the anthology, Memoirs in the Light of Day (Lamberson Corona Press, 2008). In 2006 and 2007, she received a grant from the Long Island Council for the Arts for her collaborative performance, Diary of a Mad Black Feminist, now known as the award-winning Sistas on Fire! Her poem Long Island Just Isn’t Long Enough is featured in Seasoned Women (QuadraSoul, 2008), an anthology of women’s poetry and performed by Composer Leonard Lehrman at the opening of Hofstra University’s Suburban Conference on Diversity in 2009. An excerpt from her first novel, E-Males (Aya Press, 2007), was performed at the Schomburg Center for Research in Black Culture in 2009 . Her professional memberships include Sigma Delta Chi (the Society of Professional Journalists) and the American Association of University Women.